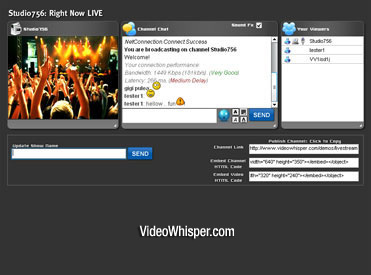 The VideoWhisper Live Streaming software editions are available as free editions. Compared to the purchased licenses these have some limitations but are great for trial evaluation, developers, resellers or low budget websites. No matter what type of php site you are running, this is a fast and easy way to integrate free video live broadcasting. PHP Stand Alone : This is the easiest to integrate to php sites, public/member/administrator areas starting from the default raw demo php files. Includes documented parameters. WordPress Plugin Easy to install on WordPress & BuddyPress. Drupal Live Streaming Module Advanced channel setup and management for Drupal 7 and older Drupal 6. Drupal 7 edition includes PPV support. Beatz PureVolume Clone Script : Turnkey social networking artist script with Live Streaming. Dolphin Plugin for the community and dating script. Elgg Module for the open source social networking engine. Additional helper plugins available. Oxwall Plugin for the social networking software platform. Moode Activity Module for this Course Management System (CMS), also known as a Learning Management System (LMS) or a Virtual Learning Environment (VLE). ClipShare mod/patch for the turnkey sharing and uploading community script by Envient that powers sites similar to the big boys: Youtube, Metacafe, DailyMotion, LiveVideo, Vimeo, MySpace Videos or Google Video. AVS mod/patch for the Adult Video Script by Envient. Clip Bucket Webcam Plugin for the free community video sharing script so members can steam live channels. Magento Webcam Extension for the online store, to showcase online channes on store pages. Best point to start installing is from the edition pages where step by step instructions are provided. Requirements are the same for paid and full editions. If you also need hosting for the rtmp server side application see RTMP hosting options.